Three hours through the mountains and we finally reached our isolated destination, beautiful, beautiful Baler. I sounded like a broken record for a D.O.T. ad campaign, because all I kept saying was, "Wow." We stopped at Sabang beach. Imagine a long strip of clean, unravaged shoreline embraced by cloud-covered mountains. Jagged islands were shadows in the horizon of a calm blue sea. Dragonflies gliding about over blooming purple flowers only breathed more life into the vision. It's no wonder that Baler was the last pocket of resistance of the Spanish forces in the Philippines during the Revolutionary days, clocking in a record year of opposition between June 27, 1898 to June 2, 1899. Hell, if I were one of the Spanish soldiers then, I'd also fight to my last tooth and rotting nail to keep this little corner of the Pacific! 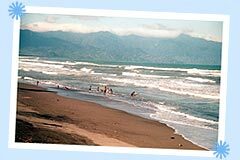 Feeling like Lonely Planeteers, we explored the other unspoilt, idyllic secrets of Baler. We drove languidly to another cove called "Charlie's Point," otherwise known as the spot where they filmed the surfing scene for the Francis Ford Coppola classic, "Apocalypse Now." Another short drive-away took us to a lush mangrove beach, where we walked through spaces between the long-stemmed plant life, and marveled at the thriving population of hermit crabs, mud skippers and spindle stars speckling unmarked paths to a jagged rock jutting out to the ocean. To call it paradise would be improper, for "paradise" connotes unreachability and a sneaky, disturbing feeling of being banished soon. No, I would call it a dream, a beautiful, surreal dream we were suddenly immersed in, feeling as if we were sitting at the edge of a forgotten world. Driving through the narrow roads of the quaint little town of Baler was also such a pleasant experience, being greeted by the friendly locals who could spot Manileños from a mile away. We stopped at the town's center where colorful stalls were out in full force. A row of small bahay kubos were decorated with rainbow-colored hats and banigs, accented with bright-yellow coconut clusters hanging from the wooden props. With only 20 pesos, I was able to savor a full fare of isaw, ube ice cream on bread, "cotton candy" sprinkled with powdered milk, all downed with pineapple and sago pampalamig. I saw a man reading a newspaper that was two days old, because they were so isolated that news of the outside world takes more than a fortnight to reach their little community. I thought that the world could have changed drastically within those two days but no one in this happy town of simple pleasures like two-peso isaw could have given a damn. As the sky became tinged with the orange sun of the passing day, our little trekking troop found our way back to Sabang beach, and appropriated our personal little spots with nothing but ice cold beer in our hands and eyes wide awake with a natural high. High from the quiet buzz of circling dragonflies and not the bleeping text messages on our cell phones. High from the soothing sound of the breaking waves and not the grating boy band voices over the radio waves. High from the sight of children blissfully playing in the shallow water of the Earth's ocean and not the floodwaters off of Jupiter street. Funny how these moments of isolation actually make you feel more connected with the world.